A project is a temporary endeavor having a defined beginning and end constrained by time/schedule. Organizations requiring project managers often find it cost effective to hire experienced program or project managers on a temporary basis. The primary challenge of project management is to achieve all of the project goals and objectives while adhering to project goals and constraints. Typical constraints are scope, time, budget and quality. The scenario to implement a project using a temporary team is attractive as it can offer lower overhead costs and rapid development of needed capability. However it requires careful selection of resource(s) with the right skills and experience at low costs. Long-term projects in contrast to short term projects are characterized as business as usual (operations or programs). Efficient and effective operations also require low administrative, maintenance and oversight costs. In practice, the management of projects and programs is quite different and as such requires the development of distinct technical skills and the adoption of separate management. 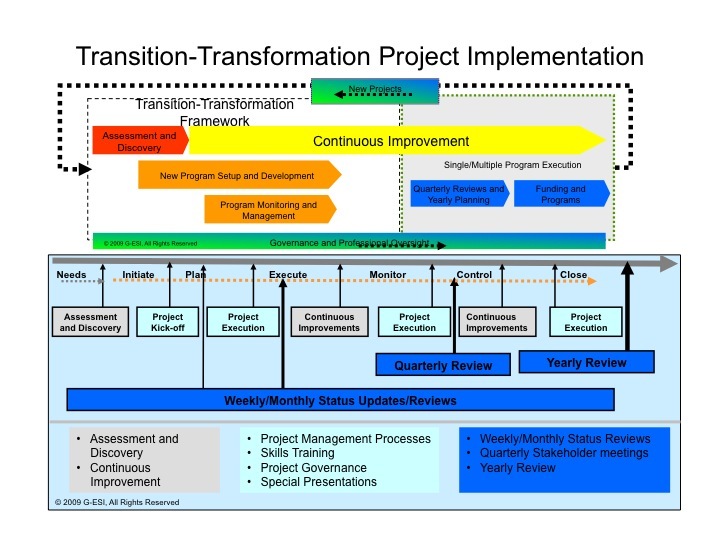 In contrast to project management, the program management primary challenge is to optimize the allocation and integration of inputs necessary to meet pre-defined objectives. This requires management governance and oversight of all the projects. Experienced and skilful program manager staff is key to achieving organization objectives. Rapid assembly of experienced and skillful program/management personnel. Program management software and tools for ensuring adherence to standards managing constraints, scope, time, budget, quality and management oversight. Utilize industry standard project management methodology. Proven project management technologies to manage and control projects and implementing standard (company and/or industry) processes are a key to successful project delivery. 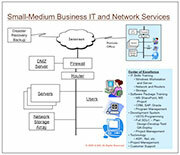 G-ESI specializes in setup of PMO and implementing network based project management technologies. Off-the-shelf partner products (Microsoft Project Server, HP PPM and Mercury Quality Center) and G-ESI’s SaaS-PPM solutions are utilized throughout an engagement. These technologies are customized to suite the project needs and delivered either by on-site implementation or as SaaS service. Program/Project Management: Experienced and certified staff to provide oversight project management with project management software as a service (PM-SaaS) to allow customer monitoring and reviews. Center Of Excellence Solution Design and Development: G-ESI has a unique solution design, development and deployment model based on center of excellence. This is to ensure the highest quality end-to-end delivery of IT projects at the best possible value. All solution designs, development and testing is done in controlled environment prior to delivery. Only the accredited and certified staff is deployed on client projects, thus minimizing unnecessary surprises and lowering costs of development through deployment. Post-Sales support: All solution delivery and implementation are offered with Gold (8 hour), Silver (12 hours) and Bronze (24 hours) service levels for Post-Sale Support. Our 24X7 call center and skilled staff are available to service toll free L1-L5 service calls as well on-line chats.